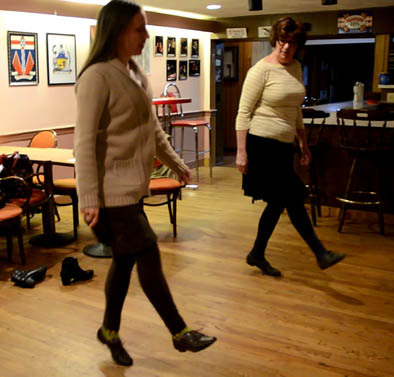 Cape Breton step dancing is characterized by close to the floor steps, precise timing, and fancy footwork that are driven by the rhythm of the music. The emphasis is on the feet, with limited body and arm movements. Boston is home to a unique branch of Cape Breton step dance. Many immigrants from Cape Breton, Nova Scotia, and Prince Edward Island moved to Boston between the 1920s and 1940s. Among them were Mary MacGillivray's parents who brought with them their love of Cape Breton dance, music, and the Gaelic language. Although Mary had no formal dance training as a child, she picked up the dance steps from listening to the music and watching dancers in the social settings where Cape Breton dancing occurs, that is in kitchens, living rooms, and at Canadian American clubs. On summer trips, she learned directly from some of the best step dancers on Cape Breton Island, including Harvey Beaton, Wendy MacIsaac, and Mary Janet MacDonald. Mary has been performing and teaching Cape Breton dance in the Boston area for over 30 years. Among her repertoire is a dance known as a "Boston Set," which materialized in the 1950s. Comprised of one jig and two reel figures, it has a distinct identity in the Cape Breton dance tradition. Although instructions for the "Boston set" have been published, in practice seems to be receding. In this FY17 apprenticeship, Jennifer Schoonover will continue her study and documentation of Mary's full repertoire, helping ensure her steps, which are stored as muscle memory, are not lost to future generations.